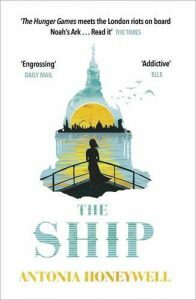 Lalla, just turning sixteen, lives in a flat in Bloomsbury in a London very different to the one we know today. Regents Park, full of homeless people with no identity cards – and thus no identity, no access to food rations – has been bombed; the British Museum is now home to further homeless, identity-less people who steal exhibits in exchange for food. All over the world resources are scarce, there is no soil to grow crops, many species, including those reared for food, are dead. Lalla’s father was one of those who suggested identity cards to allow for fair sharing of resources, but the scheme has failed. There simply isn’t enough to go round. The ship is his latest idea – a vessel filled with worthy people and all the food, clothes and resources they might ever need. But Lalla’s mother refuses to leave London. 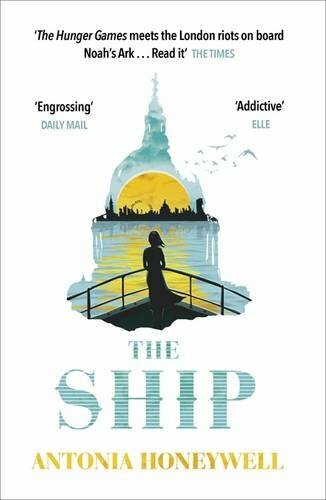 On the day of Lalla’s sixteenth birthday, everything changes and life on the ship begins. There is a lot more to this apocalyptic tale than initially meets the eye. Apart from predicting a future that seems entirely plausible, The Ship is also deeply philosophical. What is the value of existence? Is it enough to think and plan ahead for only one or two generations? If life is planned out and finite, is it worth living? I wanted to love this story. I wanted to be sucked into Lalla’s world and be transformed by it and while this will definitely be a novel that many will love, it didn’t quite work for me and pinpointing why is exceedingly difficult. Perhaps there was a level of thinking that flew over my head. Perhaps there is a disjunct between my beliefs and those of the book, though I thoroughly approve of the inquisitive spirit that reigns over the novel and it seems important to me to question the level of control we have over our lives and how that affects their meaning. Lalla’s father is compared to god, and god is compared to a benevolent dictator. Where is the freedom in that? The blend of politics and religion is both beautiful and frightening. What is not to love about this line of thought? Certainly, I have thought a lot about the novel since reading it. Perhaps, in the end, I wanted to know what happened next and my frustration is simply a desire for the novel to be prolonged. Or it may be that I couldn’t believe there wouldn’t be more people on board keen to think beyond their current comfort – though this same disbelief could be channelled at most of us living today. It could just be that I like a little more blood and guts or that these deep questions were being levelled at what feels more like a cult than the lone hope for the future of the human race. Whatever it is, and regardless of it, The Ship is a beautifully crafted fable that forces us to question our willed ignorance over the imbalance of the world’s resources and peoples. I’ll be posting a review of Taduno’s Song by Odafe Atogun in the next couple of days.